Have you ever heard of beet powder? Ya know, beets that have been dried and ground into a powder? I hadn’t until recently and I wish I had discovered it sooner. If it sounds weird, hear me out! Beet powder is loaded with vitamins and minerals including vitamins A, B6 and C, magnesium, iron, folate, potassium, iron, and calcium. It’s a great way to add natural color to smoothies and it’s common for companies to use beet powder to naturally color their products. 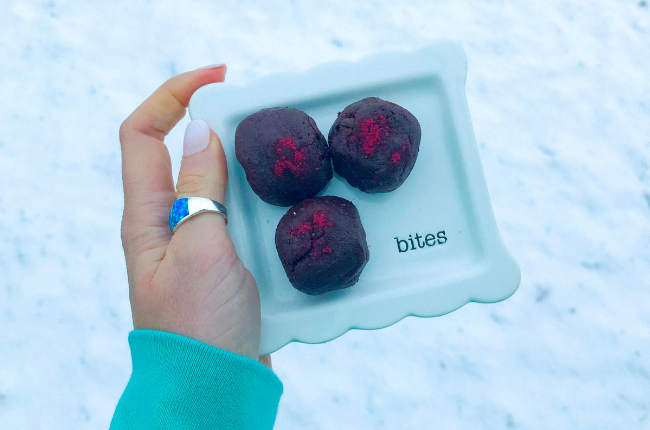 Beet powder adds a unique aspect to these bites. It gives them that “red velvet” taste and color. These little guys are super tasty and full of nutrition, I hope you enjoy them! Mix the dry ingredients first and make sure to get rid of any lumps. Add the wet ingredients, slowly adding dashes of almond milk until you get a sticky, thick dough. Roll into little bites and sprinkle with beet powder if desired.